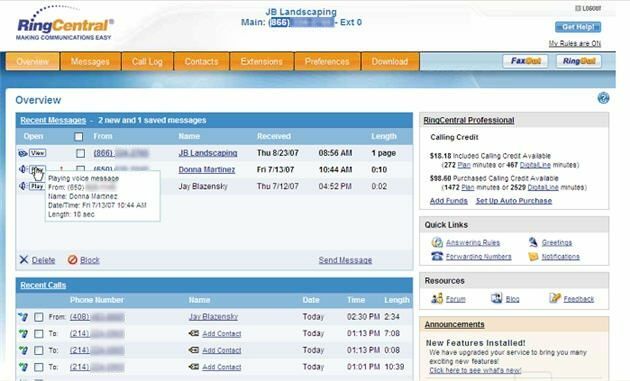 The phone call management service called RingCentral is introducing a slew of VoIP plans called DigitalLine that give users the option to use VoIP instead of, or on top of their existing landlines. The new VoIP implementation is fairly straightforward. All incoming calls can be set to be received via VoIP, letting you receive and manage phone calls while away from your landline. You can also get various minute packages to use VoIP to make outgoing calls, including an all-you-can-eat plan of outgoing VoIP for around $25/month. In contrast to consumer VoIP services like Vonage, Skype, or Comcast"s DigitalVoice, RingCentral isn"t aiming at cheap outgoing long distance providers, as much as the multi-line business crowd who"s looking for a way to handle several lines without the hardware or staffing. Small business owners will love it, since you can set up a ridiculously extensive set of rules to handle incoming calls, or reroute them on the fly with a virtual phone call manager called SoftPhone.